The parish church as seen in Blomefield's history, 1779. 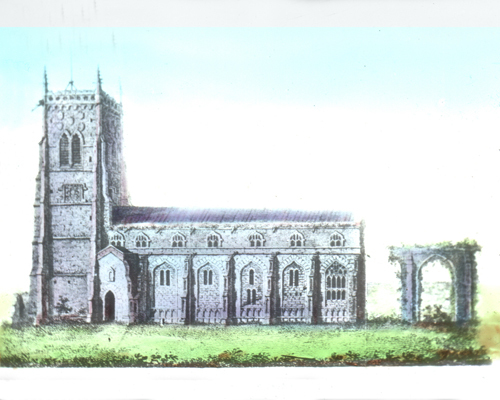 There are certain aspects of the drawing which seem out of proportion but we can see the chancel as removed in 1681 and bricked up windows. The parish church is the principal iconic building of the town and the one grade one listed building. It has been at the centre of town life in many ways since its erection at the end of the 14th century - and doubtless the previous church on the site was as well for Shipden juxta Felbrigg. The earliest picture is from Blomefield's history and as explained in A Dictionary of Cromer and Overtrand History it had already gone through a fairly chequered period. We see the church with blocked up windows and a ruined chancel. A series of photographs through the 19th century help us chart the restoration of the building, a progress which was achieved through the efforts of many parishioners, wealthy and not so wealthy. We've picked a few of the pictures for this slideshow. The pictures help us realise that much of what we see of the church today is Victorian restoration. For two centuries a convenient footpath led across where the chancel now stands - it's clearly marked on maps of the time. The reduction of the the churchyard when the roads were initially widened also led to many of the marker stones being moved - these are now grouped around the outside of the nave and chancel. There's a great deal more to explore in and around the church; we'll present some of the pictures from inside the building on a separate page.